Sometimes, as I stare out from my car window at the grey winter light bathing the salt covered cars that are inching along the ice spattered roads, I find myself madly craving food with bright colors. In particular, a juicy, succulent and deeply ugly heirloom tomato, spattering seeds in my face as I cut into it. Not going to happen. Not now anyway. But for those who want a taste of summer’s pleasures, and to make what I can officially proclaim the fastest delicious week night meal I have found yet on the site, check out Cold Sauce. This is a recipe that takes about 5 minutes of planning, less time in prep and no stove time. The only waiting you will do with this recipe is to pause overnight, while it transforms itself from canned tomatoes to garlic-infused-passion-in-a-bowl in your fridge. This is way shorter than waiting for, say, a baby, and cold sauce will not grow into a person who calls you “bipolar” for refusing to purchase a large box of Junior Mints at the movies. If you read the recipe, you will see it is scaled for a large crowd. I took it down by thirds (the recipe below has been divided accordingly, so use it as is), stopping only at the garlic instruction to ponder my next move. Fortunately, drbabs got there before me, and noted that she smashed two cloves and let them sit in the sauce overnight, then removed them in their entirety the next day. I did a modified version of this: I smashed two large cloves, then minced a very small one, which I left in when I took the sauce out on day two. I opted for 1/8 cup of my very best olive oil, which worked perfectly. 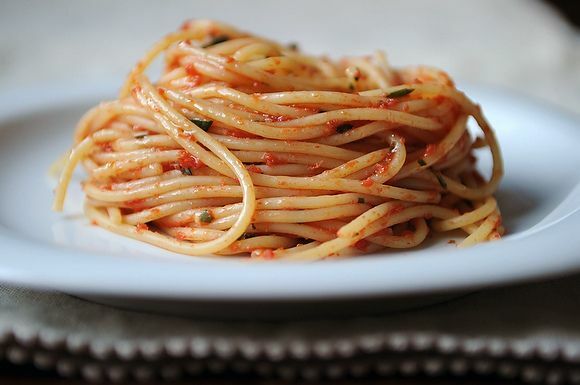 I suggest you take the sauce out about 30 minutes before serving it over hot pasta, which will ensure that it does not chill your noodles, but rather embraces them with the taste of July. Here is what the incipient pescetarian said: “Please make this for me every day.” It’s the exuberance of an 11-year-old, but I know what she means. Use a food processor to finely chop the basil or it can be done by hand. In a large bowl empty the canned tomatoes, basil, garlic, salt and pepper. Mix these ingredients together and refrigerate overnight. When you're ready to use remove from the refrigerator and add oil, stir well. In the meantime, cook the pasta al dente, drain and add the sauce. The hot pasta will warm the cold sauce. No cheese please...it's not needed. Hi Jennifer! I was immediately sold on this recipe and made it last night. It's especially great with splurge olive oil, "bio-nature" my new favorite brand of Italian organic tomatoes, and as my mom pointed out would be great with diced fresh mozzarella. Thanks for the inspiration! bio nature. cool! will look for that! I love this. One thing crabby cooks love is one less cooking task! that's right. i am mixing some up right now for monday's dinner. and then i am going to hide in the bathtub with a magazine. I do this with fresh farmer's market tomatoes, only I let it sit on the counter all day and I add a few drops of white balsamic vinegar and a pinch of cayenne. I have never tried it with canned tomatoes, but why not? Makes sense for winter. Jenny, I like your recipes. that sounds divine. i can't wait for summer. I am going to make this recipe right now! I can't wait to eat it. In regards to Basil - we grow and freeze it evey year. It tastes exactly the same although it does not look as good as a garnish. In fact I have frozen basil from a few years ago that I will use in this recipe. It is still as pungent and tasty as when I first picked it. freezing from our garden: Using a hose,spray basil in the AM and pick in the PM, as the water takes away the lovely oils and by evening the oils have replenished. Pick basil, strip leaves from stems. I freeze leaves whole, or chop them and put them in freezer safe bags, label with date and freeze. Sometimes Safeway will have large containers of Basil in which case, I rinse lightly and freeze as above. I made this cold sauce with Basil from 2006 (found in the back of the freezer...) - and as soon as I cut open the bag, the smell of fresh basil permeated the air! This recipe is great, the only problem is waiting so long to eat it! Basil is very rare to find where I live & when I see it, I behave the same as I do for Meyer Lemons. For the brief season they're in the store, I buy a ton. I'll save this recipe for summer; it sounds delicious. thank you! this sauce was delish. ps. are the homemade mints easy to make? have a weakness for mint-anything. no they are easy; links here are hard to post but go to joyofbaking.com and use search engine to find the recipe i always make. yum. maybe i will stay home from work & make them today! of course it's ok! i still say to my mother, "what kind of person wears thick white socks with black flats??" This sounds so delicious. Very excited to be making it - basil plant found at - of all places - local bodega. Thank you for sharing! basil unearthed anywhere in feb is a true gift no? Ah, but you see, smuggling in anything immediately makes it unattractive to a child. I could sneak in a 50 lb mixture of every candy imaginable and it would be deemed "gross" because I didn't pay $5.00 for every ounce. We have serious consumerism issues happening around this house. I can't wait to try this sauce - so easy and it sounds so fresh-tasting. By the way, I haven't had any problem finding fresh basil on the Eastern Shore of MD...yet! Oh, Rhonda, wait until they have to start buying stuff with their own money....then all of a sudden smuggling candy into the movies (and finding a great dress on sale) is cool. Somehow, I missed the "put in the fridge overnight" part of this recipe - I was focused on the "ready in 5 minutes/no cooking" part, I guess! Despite my inability to fully comprehend what I read, this sauce was still pretty darned tasty after just an hour of sitting on the counter. Can only imagine the culinary delights it would produce if given the proper amount of time for the flavors to mingle! I think this would be a fantastic sauce to whip up on a Sunday evening, store in the fridge and count on for that busy weeknight when you are sure you will melt into a puddle if you don't get your family fed in 15 minutes flat! Jen - YES! Let's plan something soon! Thanks - this recipe is right up our alley! But, oh, those teenaged girls.... My daughter (the "incipient" fashionista) has this delightfully sneering way of referring to my black Lucy workout pants and black Costco jacket as "the black tracksuit." hilarious. one day you will have your revenge. Back in the early 70's I studied in Italy. One of the favorite dinners made for me by the most wonderful Italian woman, then in her ninth decade, who housed me for a summer was a tomato sauce that we would make late in the day after I came back from my studies. It consisted of onions, tomatoes, garlic, basil, salt, pepper, and Olive Oil (made from her own Olives). We would sit at the table which she not only cut everything on but where we also ate all of are meals and put all of these freshly picked ingredients into her largest bowl which then sat out overnight for the next days dinner. The memory of that aroma as I woke the next morning filled the small apartment with something close to as I would think of later as an aphrodisiac. That night we would boil her fresh made pasta and top it with this sauce and drink wine from her son's winery.It was truly magical! Thank you so much for this recipe, for it brought back great memories from those very special evenings many decades ago! Gosh I wish I was you in the 70's!! I can smell that sauce from here - 40 years later and across The Pond. what a wonderful story. i can smell it now. thank you so much for sharing that great memory! any thoughts on whether this will work in a baked pasta dish or will the baking kill the appeal? I haven't made it in awhile, but I think it would work. This looks delicious - I love simple vibrant pasta sauces. I also like that it can be kept in the fridge, ready for whoever arrives home hungry and impatient...just boil some pasta and voila - dinner, can the griping. these mom stories are seriously making me laugh. going to the movies alone (complete with private scarfing of smuggled and/or purchased over-priced treats) is one of the great maternal sanity restoration devices! malted milk balls for me, please. Have you tried to find basil at the store lately? I can't. I read, somewhere, something about a fungus or blight or something that's made it scarce this winter. Regardless..I imagine a nice scoop of jarred (or frozen if you have it) basil pesto would work. Yes? believe it or not (well believe it because it is a fact) i bought a small basil plant at whole foods the other day. i will kill it, but it did yield enough for this recipe. I really needed a Monday morning LOL moment - you never disappoint, dear Jenny! thanks for giving me a head start on the scale!!! I refuse to buy candy at the movies, seeing as the kids have a lifetime supply from all the holidays. We just smuggle it in. And I'm the designated smuggler, as my pocket book is the biggest. I have never heard of putting cold tomato sauce on hot pasta. My parents would disown me! I guess I won't tell them. Thanks for finding this one, Jenny. i know but just try it. it is an exciting life development. i smuggle too, btw. Thanks for posting this! I love the idea of letting the flavors getting intimately acquainted overnight. I have in my file a long-ago recipe for Ed Giobbi's Hot Spaghetti with Cold Tomato Sauce, which I adored, but only worked if you had on hand two pounds of drop-dead gorgeous (or ugly!) ripe tomatoes. I'll be assembling this tonight. That is a great summer recipe -- I've made it, as well. I'm a big fan of Ed Giobbi -- a number of his recipes made it into my Times Cookbook. i wonder if you will like this version? i hope so! Great find Jenny! I too long for the bright colors and warmth of summer ... will turn to this soon for some summer pick-me-up. And I am sad to say that I do purchase the jumbo box of Jr Mints, and then proceed to make myself ill eating them all. Every time. the bipolar comment was specific to the fact that make these mints (our version) at home but then disallow them at the flicks; it is not a nutrition thing as a cheapness thing, plus one has to choose between a soda or a candy at the movies on my watch, unless i am alone, in which case i too down an entire box. so, she has a point. which i have now explained with too many words.